Under the brand name TASKalfa Kyocera-Mita is rolling out the first four models in its next multifunctional generation in January 2009. 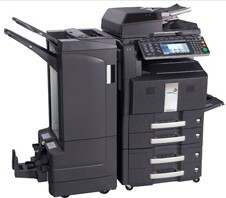 The TASKalfa range consists of four A3 multifunctional devices: the TASKalfa 500ci (40 pages per minute (ppm) color/50 ppm black); TASKalfa 400ci, (40 ppm color/40 ppm black); TASKalfa 300ci (30 ppm color/30 ppm black); and the TASKalfa 250ci (25 ppm color/25 ppm black).. Along with the name the devices’ new design will first catch the user’s eye. All models can include up to a 4,100 sheet paper capacity with the ability to accommodate heavier paper stock. The TASKalfa 500ci and 400ci comes standard with two 160GB Hard Disk Drives (HDD) and the 300ci and 250ci features a standard 80GB HDD. The TASKalfa series offers the choice of two optional document processors, Dual Scan or a Reversing Automatic Document Processor.